This second edition increases the universality of the previous edition by providing all its codes in the Java language, whose compiler and development kit are available for free for essentially all operating systems. In addition, the accompanying CD provides many of the same codes in Fortran 95, Fortran 77, and C, for even more universal application, as well as MPI codes for parallel applications. 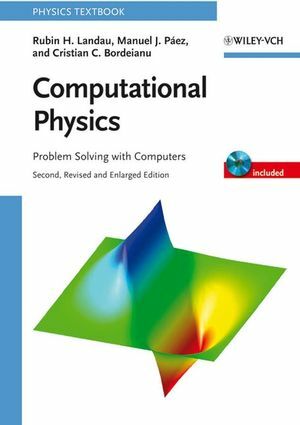 The book also includes new materials on trial-and-error search techniques, IEEE floating point arithmetic, probability and statistics, optimization and tuning in multiple languages, parallel computing with MPI, JAMA the Java matrix library, the solution of simultaneous nonlinear equations, cubic splines, ODE eigenvalue problems, and Java plotting programs. Rubin H. Landau, PhD, is a professor in the Department of Physics at Oregon State University in Corvallis. He teaches courses in computational physics, helps direct the Northwest Alliance for Computational Science and Engineering, and has been using computers in theoretical physics research for the past 30 years. The author of more than 70 refereed publications, he has also authored the books Quantum Mechanics II, A Scientist's and Engineer's Guide to Workstations and Supercomputers, and the first edition of Computational Physics, all of them available from Wiley. Manuel J. Páez, PhD, is a professor in the Department of Physics at the University of Antioquia in Medellín, Colombia. He teaches courses in computational physics, programming, and nuclear physics. He and Professor Landau have conducted pioneering computational investigations in the interactions of mesons and nucleons with nuclei. Cristian C. Bordeianu received his physics degree from Bucharest University, Romania, and his M.Sc. degree in Computer Science from "A.I.Cuza" University in Jassy, Romania. He is currently completing work towards a Ph.D. degree in Nuclear Physics at Bucharest University. He has over ten years of experience in developing Computational Physics educational software for high schools and University curricula. His current research interests include chaotic dynamics in nuclear multifragmentation and plasma of quarks and gluons. "Landau and Paez's book would be an excellent choice for a course on computational physics which emphasizes computational methods and programming." Includes new materials on trial-and-error search techniques, IEEE floating point arithmetic, probability and statistics, optimization and tuning in multiple languages, parallel computing with MPI, JAMA the Java matrix library, the solution of simultaneous nonlinear equations, cubic splines, ODE eigenvalue problems, and Java plotting programs.